Manufactured by: L&M Construction Chemicals, Inc.
For the most abrasion resistant, heavy duty floor topping, we recommend EMERYTOP 400. This flowable, natural emery aggregate floor topping produces a very durable floor. EMERYTOP 400 provides an economical, abrasion resistant solution to very severe and abusive concrete floor conditions where other solu..
For the most abrasion resistant, heavy duty floor topping, we recommend EMERYTOP 400. This flowable, natural emery aggregate floor topping produces a very durable floor. EMERYTOP 400 provides an economical, abrasion resistant solution to very severe and abusive concrete floor conditions where other solutions have failed. EMERYTOP 400 uses polyhederal shaped isostructures of emery as its primary aggregate base. Our natural emery aggregate contains nature's highest content of aluminum oxide and ferric oxide for unsurpassed toughness. This unique aggregate has a hardness (Mohs scale rating) approaching that of industrial diamonds. EMERYTOP 400 produces a dense, cohesive mass that is rust-free, chemically resistant and results in a thick floor surface for maximum abrasion and impact resistance. EMERYTOP 400 floors are also resistant to the destructive attacks of mild organic acids, alkalis and oils. EMERYTOP 400 outperforms normal concrete and high strength iron topping floors. EMERYTOP 400 resists moisture deterioration, and is harder and more abrasion resistant than iron aggregate toppings. Its unique formulation provides a substantial savings in material cost when compared to iron toppings. In addition to superior performance, EMERYTOP 400's flowable formulation can be placed and finished like concrete. These superior physical properties make EMERYTOP 400 an excellent choice for heavy duty industrial service Class 6 and 7 floors, as described by ACI in its Manual of Concrete Practice standard, ACI 302.1R. Basic Use: EMERYTOP 400 contains natural emery aggregates which contain a minimum of 58% natural aluminum oxide. Aluminum oxide aggregate, the hardest mineral approaching diamonds, reinforces concrete floors by developing a dense, long lasting, abrasion and impact resistant floor to withstand the most severe wear conditions. 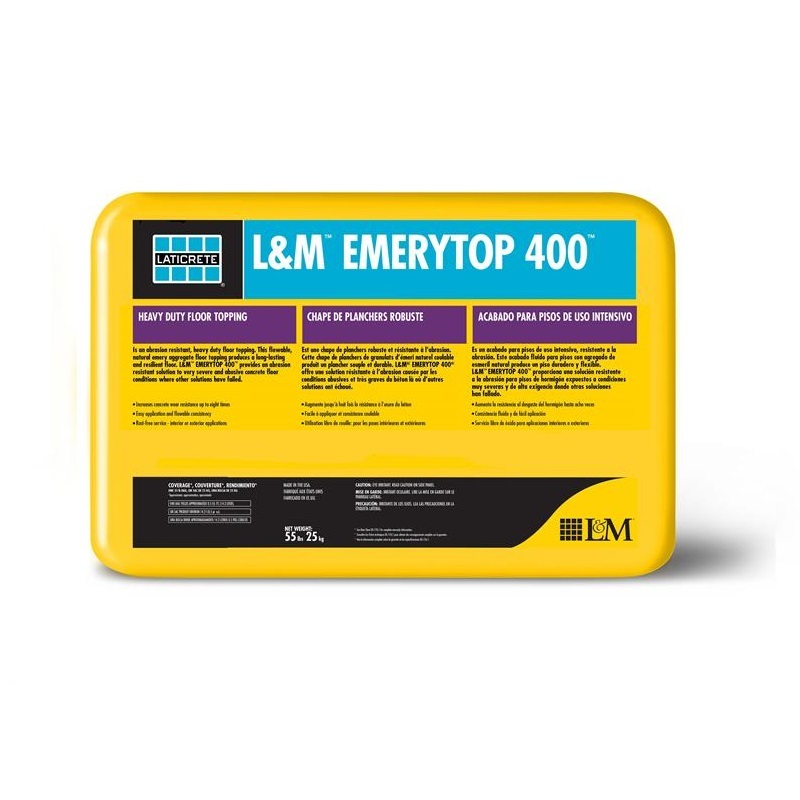 Use EMERYTOP 400 in key areas subject to heavy traffic, impact abrasion and continuous wear such as resource recovery plants, tipping floors, roll-off areas, foundries, loading docks, truck, tractor and auto installation and repair areas, mill scale sluiceways, smelters, machinery manufacturing plants and generating stations. EMERYTOP 400's unique nonrusting formula is ideal for outside loading docks and industrial plants using chemicals. Use EMERYTOP 400 on floors requiring optimum surface density to resist mild industrial chemical penetration. Fast turn around for weekend shut downs. Easy application, new flowable consistency. Significant cost savings over iron toppings. Resists severe single point impacts.